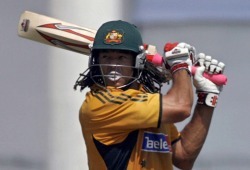 Andrew Symonds (born 9 June 1975, Birmingham, England) is a former Australian cricket team all-rounder. A two-time World Cup winner, Symonds is a right-handed middle order batsman and alternates between medium pace and off-spin bowling. Since mid-2008, he spent most of the time out of the team, due to disciplinary reasons, including alcohol. In June 2009 he was sent home from the 2009 World Twenty20, his third suspension, expulsion or exclusion from selection in the space of a year. His central contract was then withdrawn, and many cricket analysts have speculated that the Australian administrators will no longer tolerate him, and that Symonds may announce his retirement. One of Symonds' biological parents was of West Indian background.Symonds' adoptive parents Ken and Barbara moved to Australia shortly after his adoption, when he was three months old.Of the adopted siblings, Louise Symonds participated in Gladiators. He also has two non-adopted siblings. He spent the early part of his childhood in Charters Towers, northern Queensland, where his father Ken taught at the private fee paying All Souls St Gabriels School, which Andrew attended. He showed sporting prowess from a very early age. "Dad was cricket mad. He’d throw balls to me five or six days a week, before school, after school. And we’d play all sorts of games inside the house with ping-pong balls and Christmas decorations. "Much of his junior cricket was played in Townsville for the Wanderers club, father and son making the 270-kilometre return trip sometimes twice a week. The family later moved to the Gold Coast, where his parents were on the staff of All Saints Anglican School in Merrimac. Symonds was a student at the school. Symonds is an aggressive right-handed batsman who can also bowl off spin or medium pace, making him a good all-rounder. He is an exceptional fielder, with a report prepared by Cricinfo in late 2005 showing that since the 1999 Cricket World Cup, he had effected the fifth equal most run-outs in ODI cricket of any fieldsman, with the fourth highest success rate. He is very agile for his size and weight (medium-heavy build; 187 cm tall), has excellent reflexes, is able to take catches well and has a powerful and accurate throwing arm. His nickname is Roy, shortened from the name Leroy, after a coach from early in his career believed he resembled local Brisbane NBL hero Leroy Loggins.In 1995, after playing in his first season for English county Gloucestershire, Symonds won the Cricket Writer's Club Young Cricketer of the Year award.Shortly afterwards Symonds was selected as part of the England A team that was to tour Pakistan in the winter, however, he decided not to go, instead choosing to pursue an international career for Australia. His place on the tour was later taken by Middlesex player, Jason Pooley.